Volunteers do spectacular work in our communities every day, and even a small gesture of appreciation goes a long way. Give your volunteers a little love this year with these 50 low-cost ideas. Showcase your volunteers as a great example to others. Social Media Shout-Out – Use Facebook Group pages or Twitter to spotlight a volunteer each month. Encourage “likes,” compliments and shares. Be sure to monitor the page. “Chalk” It Up to Our Volunteers – Buy chalkboard paint and use it to cover a highly visible section of wall. Each week or month, write a thank you and compliment on the wall. Keep chalk handy for others to add to it. Helping Hands Day – Distribute handprint cutouts and ask everyone to write a volunteer name and compliment on the cutout. Tape them to a highly visible wall on a special day. Thank You Boards – Decorate poster boards with a volunteer’s special interests and a thank you message. Provide a space for folks to sign, and put it up for everyone to see. Recognition Ceremony – Before or after a fundraiser or event, recognize volunteers with a certificate and a nice comment about how they have helped. Thank You Box – Set out a box and index cards, with a volunteer name and instructions on the box in a high traffic area. As people come and go, they can write a special message for the volunteer and put it in the box. Be sure to check over the entries before giving the box to your volunteer. 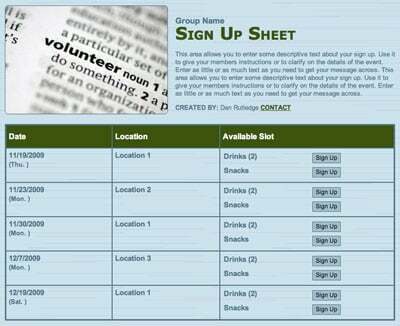 Bulletin Board – Decorate a bulletin board that showcases volunteers each month. 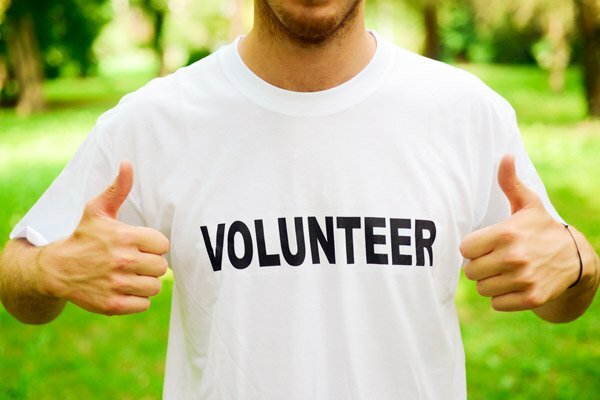 Volunteer Spotlight – In newsletters or emails, write a paragraph about a volunteer and why they are special to the organization. Parking Spots – Have regular volunteers? Designate volunteer parking spots close to the building. Parties don’t have to be complicated, and they can be built into the workday or another event. A Cheers to You Party – Why do we wait till people are dead to talk great about them? Put your volunteer in a chair and ask several folks (ahead of time) to stand up and give a “toast”-style speech as a tribute to the volunteer. Sunrise Surprise — If you have a large amount of volunteers working a morning event, provide food and snacks for energy. Place a sign on the table with thanks and appreciation. Silly Awards – Hand out silly certificate awards, such as Most Likely to Need Coffee, Most Likely to Become One of Santa’s Elves, Most Likely to Quit This Volunteer Gig and Start Working Retail, etc. Potluck – Invite volunteers to an appreciation party and ask folks, such as teachers or staff members (not volunteers) to bring food. An alternative idea is to solicit donations from local businesses that may benefit from the marketing opportunity to sponsor this event. Cookie Swap – Ask folks (not volunteers) to bake three to five dozen cookies each. Instruct them to put 10 cookies in different Ziploc bags. On the day of the cookie exchange, your volunteers get a gift bag and go cookie shopping! Genius tip: Send out a SignUpGenius invite to make sure you have enough people baking cookies! Several local bakeries may help you collect just what you need. Meet the Stars — Ask a local celebrity that supports your organization to surprise your volunteers with a meet and greet. You could also arrange a behind-the-scenes tour of a local hot spot, performance venue or sports arena. Volunteer All Stars – Grill out at a local park when the weather is nice and hold a softball game — volunteers versus professional staff. Talent Show – Incorporate some live entertainment into an event. Ask a few folks ahead of time to perform at the appreciation party. Ideas: kids who play the piano, teens who sing or play guitar. Night Out - Give moms and dads a free night of babysitting. Tap into your middle and high schoolers for help with this. 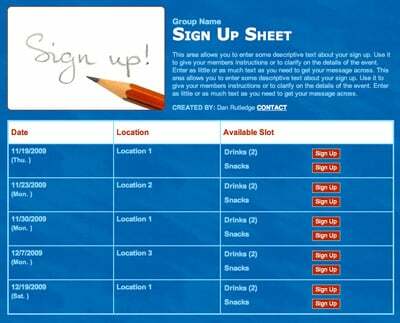 Genius Tip: Use SignUpGenius for mom and dad to reserve spots for their children, and schedule your babysitters as well. Pair small items or candy with a cute pun, written on a handmade card. The Internet abounds with different ideas for this one! Thank for Your “Commit-mint”/ Your Help “Mint” So Much! We “Donut” What We Would Have Done Without You! No One Holds a Candle to You! Do-it-yourself projects can be a low-cost, thoughtful way to say thank you. Turn this idea into a staff meeting to get gifts ready for your volunteers. Fairy lights/lanterns – Buy a mason jar and glow-in-the-dark acrylic paint. Dot the mason jar all over with paint. It becomes a beautiful lantern in a dark room. Add treats and put the lid on top (it will glow better when empty). Add glue and glitter to the lid for extra pizazz. Handwritten Cards – A simple handwritten, signed card with a nice message is sometimes all you need. Thumbprints work great if it’s from a group of kids. Thank You Tree – Buy a miniature tree, artificial or real, and tie gift cards to it like ornaments. Best used when multiple people are giving gifts to a small group of volunteers. Video – Film a video of your group talking about volunteers, saying thank you, singing or holding letters that spell out thank you. Post on social media or attach to a broadcast email. Even better: Film a video of individuals that have benefitted from a recent event or volunteer initiative. This can be highly impactful and help volunteers know the value of their efforts. Framed Picture – Take a group picture and buy a frame with a mat. avFolks sign around the mat. Picture Items – Put a group picture on a book bag, cup or coasters. Food – Mini-loaf cakes, chocolate-dipped pretzels, trail mix in a cute jar, any special food item made with love. Recipe Books – Have staff members collect their favorite recipes and compile booklets for volunteers. Bookmarks – Find your favorite quotes about volunteering or service, laminate and punch a hole for ribbon on top. Have a smaller group of volunteers or generous group of corporate donors? Small, thoughtful items from local stores will make volunteers feel pampered. Monogrammed – Who doesn’t like a gift with their name or first letter of name? Notecards, tote bags, cups or necklaces are a good place to start. Corporate sponsors may also pay for this if they get their name on the product as well. Lanyards – Order custom lanyards with your organization’s logo for volunteers to place their badges. T-Shirts - Pass out same color T-shirts to your volunteer team with a name or slogan. At events they can wear their shirts, and other folks will easily identify them! Supplies – Purchase useful volunteer supplies: Clipboard, antibacterial gel, extra pens and organizational apps. Stay-cation in a Bag – Package an aromatherapy candle, slippers or cozy socks with a heartfelt note. Spa Day in a Bag – Help your volunteers relax with bath salts, chocolate, a candle, tea packets and ear buds. Movie Night in a Bag – Pick a seasonal movie or a movie gift card and package with popcorn and candy from the dollar store. “Book” Bag – Decorate an inexpensive canvas tote with paint or a iron-on patch and put a book, audiobook or gift card inside. Check out half-priced bookstores for good deals. Travel Bag – For the volunteer on the go: travel and toiletry items, ear buds, a reading light, energy bars, trail mix or collapsible bag. Seasonal Items – If you have a big volunteer effort during the winter or summer months, give out hand warmers, gloves, a scarf, water bottles, sunscreen or hats. Volunteers are important parts of many organizations, so encourage a spirit of volunteerism that will fuel your mission and keep everyone coming back for more! Emily Mathias is a freelance writer living in Charlotte, N.C.
We did a catered breakfast buffet last year..2018. 3 hour event. Then we had awards and gifts, including hand written cards for each. Lastly, we had Laughter Yoga! Absolutely awesome and the volunteers loved it and felt appreciated! a T Shirt is great. But nothing is required. Happy to do it! They are all good ideas - it depends upon the specific group - I personally like the idea of a catered luncheon with some entertainment and an awards ceremony, acknowledging how many years each of the volunteers has served in that capacity - both verbally and printed on their certificates of recognition. Organize Room in the Inn volunteers with a sign up!